One of my New Year's resolutions last year was to try one recipe each month out of Bon Appetit magazine. I probably keep that resolution once every three months but earmarked several recipes out of the March 2009 issue. I love the R.S.V.P. feature where they track down reader's favorite dishes from various restaurants because it combines two of my loves, travel and cooking. I earmarked this recipe for Palmer House Brownies immediately as I love brownies and loved the idea of using apricot preserves as a glaze. These brownies are not your average run of the mill brownies. 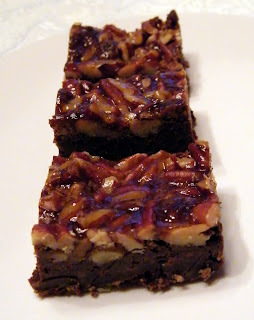 I am by no means a brownie snob and sometimes use a box mix and other times make them from scratch but these are decadent. Rich and nutty, they accomplish what most brownie recipes aren't able to; be simultaneously cakey and fudgy. The apricot preserves add an ever-so-slight tang and an elegant finish. I think they would also be nice with almonds and raspberry preserves. Simply delicious! Preheat oven to 350 degrees F. Butter and flour 8x8x2-inch metal baking pan. Melt chocolate and butter in heavy small saucepan over medium heat, stirring often; cool to lukewarm. Using electric mixer, beat sugar and eggs in large bowl until well blended, about 1 minute. Whisk in melted chocolate4 mixture. Sift flour, baking powder, and salt over; fold to blend. Transfer batter to prepared baking pan. Sprinkle nuts over and press gently into batter. Bake brownies until edges are raised and cracked and tester inserted into center comes out with some moist batter attached, about 45 minutes. Melt apricot preserves in small skillet over medium heat. Strain preserves; brush melted jam over hot brownies. Cool 1 hour, then transfer to refrigerator and chill until cold, about 2 hours. Cut into 16 brownies and serve chilled. These sound really good, and there are lots of nut/preserve combos you could use, depending on what you like! These look incredible! Thanks for submitting this to Magazine Mondays! These look soooooooooooooo yummy and unique too. I saw these in Bon Appetit as well...they look so good! Thanks so much for sharing! I made these several times and loved them, and then misplaced the recipe. I'm so glad to be able to make them again. They are truly the best brownie I've ever had!